Golddiggers of 1933, with its story of young showgirls trying to make ends meet during the Depression, is one of the most prominent films of the early 1930’s and is a brilliant commentary on the problems encountered by people of all walks of life during the Great Depression. Alternately funny and quick-witted and serious and slow, the film is an exercise in opposites, examining both the difficulties of the era and the pervasive hope that all will turn out ok in the end. The dialogue is interspersed with magnificent stage numbers choreographed by the legendary Busby Berkeley, but the movie avoids cheesiness or false sentiments by having all the musical numbers appear within the context of a stage show. Without a doubt, the most poignant moment in the film is the last number, a startlingly real and grim analysis of the economic situation of the day and its effect on the population. 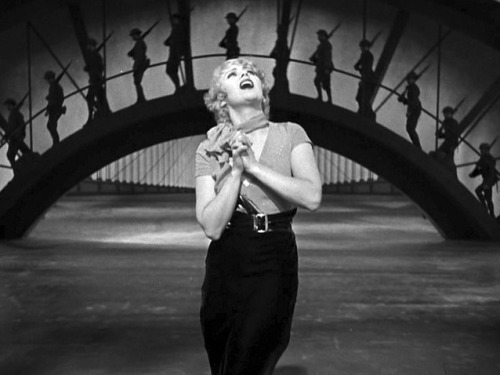 The number, sung by a young woman who is clearly a prostitute, is a lamenting torch song dealing with the harsh realities that the American public has to deal with during this difficult time, and alludes to the fact that now that this woman’s significant other can’t support her anymore, she is resigned to the streets–not an unreal situation during the Depression. The next verse touches on the physical labor that people put into the land, a land that no longer gives to them. And once he used to love me/I was happy then/He used to take care of me/Won’t you bring him back again? ‘Cause ever since the world began/A woman’s got to have a man/Forgetting him, you see/Means you’re forgetting me/Like my forgotten man. Note the song’s usage of “you” instead of “they,” addressing the unknown force at fault directly. It is not sung out of self-pity, but out of anger. It addresses the universalism of this crisis, affecting everyone from all walks of life, leaving them without a thing in the world. We then see scenes of those affected by the Depression, beginning with a single mother and an old woman in a rocking chair, before being shown scenes of men returning home from war, on the battlefield, in breadlines, and finally marching in silhouette, reinforcing them as “forgotten men.” As they march, we see men in ragged clothes and their families on the stage, while Joan Blondell appears at the center and brings the song home, singing the last stanza in an incredibly heartbreaking, powerful moment, surrounded by the breadline men, the soldiers marching behind her, and the families at her side. I dare say that this is one of the most memorable moments of the early 1930’s. Not only does it pack an intense punch, but it really sums up the era of pre-Code talkies. Stark, expressive, and poignant, it really shows what the future of cinema could have been, if the Hays Code hadn’t come in and dictated filmmaking for the next 35 years. Your comments were very well written. The story’s formula a typical “Cinderella” theme. The year before this film was made the Federal Government had evicted the “Bonus Army” from the “Hooverville” encampment in Washington, D.C. This “Army” consisted of WW1 Veterans and there famlies who were trying to acquire Their “Bonus” for honorable service in WW1.The amount was $60.00 per serviceman. Wow, very interesting! Thank you for your comment! How did you get this information? This is one of my all-time favorite films, and probably my favorite sequence from it. Though Ginger Rogers singing We’re in the Money is pretty awesome, too. But this one almost always makes me tear up – Joan Blondell isn’t much of a singer (good choice to let her mostly talk-sing it and have Etta Moten do the heavy lifting vocally), but she gets the emotion across so beautifully. I watched 42nd Street and Gold Diggers of 1933 back to back not too long ago, and it was interesting to note that 42nd Street has a stronger narrative (the Joan Blondell-Warren William plot in Gold Diggers always falls flat to me, and the different narrative strands aren’t as tight as they are in 42nd Street), but Berkeley’s choreography is much more advanced and flamboyant in Gold Diggers, especially in Remember My Forgotten Man and the Shadow Waltz. Some of his best work, I think, Lullaby of Broadway notwithstanding. This film was recently suggested to me and here is a post about it… I really want to see it now. Excellent post. I adore this film and the last number never fails to make me a little teary eyed. In that last sequence Joan Blondell leaves her mark. So many excellent actors, but the film belongs to her. Definitely one of the best of the 1933 trio of Berkeley films – very powerful stuff. I agree that the plot is sometimes not half as strong as 42 street, but it also shows the hard-boiled and cynical side of the depression – and is a great example of a pre-code movie. A plot that involves a girl getting money out of a man who has supposedly slept with her? That would have been unheard of after 1933! My forgotten man is undoubtedly the highlight of the film for me musically – and its Joan Blonde who so expertly gets it across in the opening section. Such a stirring number, and probably one of the most effective in any Hollywood musical. Thanks for your comment. Yes, a girl getting money out of a man who slept with her would drive Will Hays up the wall! “Remember My Forgotten Man” is almost a stand-alone number. The rest of the movie is just an excuse to have that number on film. Don’t forget though, that while Joan Blondell acts the scene, it’s Etta Moten who sings the lyrics so powerfully. Thanks for the dubbing reminder. This is the case with so many movies and those poor dubbers don’t get the credit they deserve! I realize this post was written a few years ago I wanted to comment anyway. My Forgotten Man is the best song in the whole movie. I think it reminds us that we need to take better care of our veterans. Tragically the shooting in Thousand Oaks,CA by a Marine veteran is such a grim reminder that many of our veterans from are ” forgotten men” and women too for that matter. Thank you so much for commenting. And yes, I agree wholeheartedly. So many veterans return from war with PTSD and other mental health disorders, and while we’re quick to send them off to war, we’re hesitant to care for them upon their return. It was true then, and it’s true now.